A well thought out family true hybrid fast cruiser/fisher, ideal for either cruising or fishing it is amazing how much they have managed to cram into 24 feet and still retain the spacious feel of a much larger boat. Nice galley, comfortable cabin, separate heads, all the features you need, and a deep cockpit to keep you safe when you are hunting the deep for your dinner! 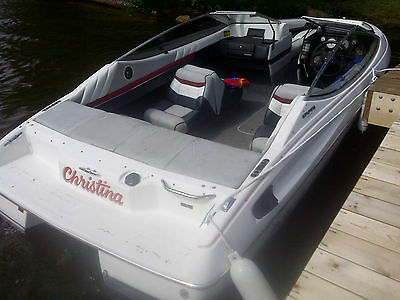 Plenty of power, this boat is going to get you from A to B with maximum fun factor, but when you get there you have a comfortable home from home in which to chill out! 1996 Bayliner 2452 powered by mercruiser V-8, 5.0L with alpha one outdrive, 2 new mercury mercruiser propellers, 2 bank battery charger, dual batteries with main switch (one is new), 1000W power inverter, 2 bilge pumps, new Bennett auto tab control, custom trim tabs, new wash down pump 20l per min, new electric sink pump, new macerator pump,10 gal fresh water, 20 gals grey water, full head, sink, propane stove, electric heater, shore power and cable , fridge, LCD tv and dvd, bluetooth am-fm stereo, vhf radio, sleeps 4, lowrance colour X510 fishfinder, compass, anchor, dock bumpers, 30-amp dockside power with 50 ft cord, full enclosure, 2 big john electric down riggers with quick mount, four stroke high thrust Yamaha kicker with controls on heavy duty mount, on double axle Eagle trailer with spare tire. 2 service manuals (books) one for engine and one for sterndrive (alpha one generation 2). Everything works on boat- ready to go! Tom 416-878-6404 PLEASE no low ballers, serious inquiries only. This particular model iswell designed for versatile style. Great room in the back for fishing, but also nice cabin space for overnighting. 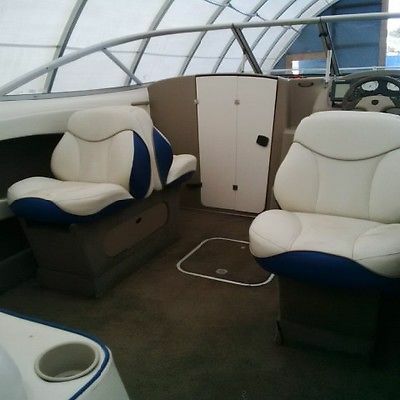 This Boat Is Perfect For Cruising the Coast Line, Lakes, Islands or Off Shore Fishing. Hardtop Cruiser equipped with Mercruiser 5.0 carbureted (220 hp), Single in /out Engine, Alpha One Outdrive, GPS, Sounder, Compass, Front and Rear Spreader Lights, VHF Radio, AM/FM CD Player, with Full Enclosure, anchor, chain and more.Boat featured with Refrigerator, Microwave Oven, Electric Stove, Pressure Water System, Dual Batteries w/Switch, Toilet, Sink, Hot Water Heater, Heated Freshwater Shower, Shore Power, Pole Holders, Swim Platform, Swim Step w/Fold Down Ladder, Stainless Steel Grab Bars, Driver & Passenger Captain Seats, Fold Up Bench at the rear,Bed to Dining Table ( inside transformation), Outside Dining Table, Built in Cooler, Complete Curtain Set for storm / mosquito protection.Model contains full overnight accommodations for up to four adults.Condition: Boat is in great shape, excellent condition, low hours usage (411), professionally maintained and runs well. Feel free to visit us and see this boat in person - surveys and mechanical inspections are welcome prior to bidding. Boat are ready to run and all systems are operational. Trailer: Tandem Galvanized Trailer accompany the boat. 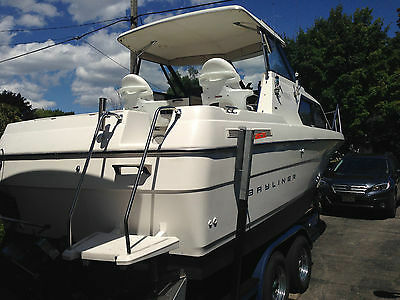 Boat Details: New canvas enclosure, top and sides, with rear zip screens (Upgrade of 2013), additional back up batteries. 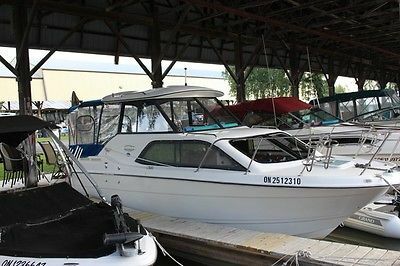 (HIN #USDA75XEI203)Buyer is responsible for the boat pick up but delivery to US and Canada possible after it is paid in full and upon agreement.Please submit your offer and it may be accepted!